We had a couple of pumpkin vines in our back yard and there were so many pumpkins that the people I gave them to refused my second round of the bounty so we've been eating a lot of pumpkin with dashi and pumpkin soup, the only ways I cook pumpkin. I found the last pumpkin among the leaves of my mango tree. It had dropped off from the vine but was still hanging by the string that held it to the tree. I don't know how long it had been there but the pumpkin when cut was a deep orange color, exactly the way I like my pumpkin. A deep orange pumpkin guarantees sweet, fluffy and fragrant pumpkin flesh and plenty of beta carotene, an antioxidant that is converted into vitamin A in the body. One of my best loved cook book is San Francisco's Cooking Secrets by Kathleen DeVanna Fish from which my best recipes are adapted, including a yolkless tiramisu which has no comparison. There are no photos in the book but it is filled with recipes for simple, elegant dishes from the top restaurants in San Francisco. 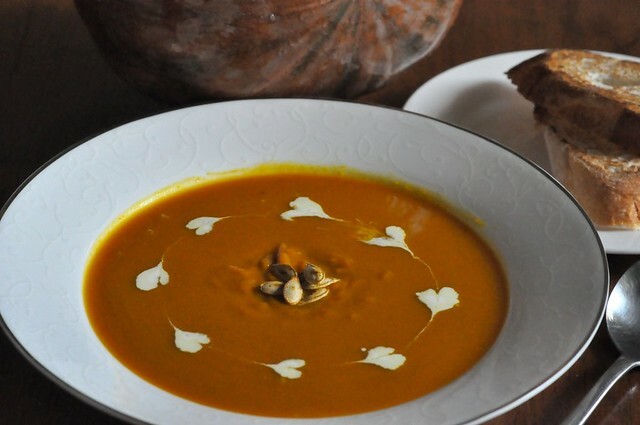 The winter squash (such as butter squash and pumpkin) soup in the book is a quick two-step recipe but makes the best pumpkin soup ever. 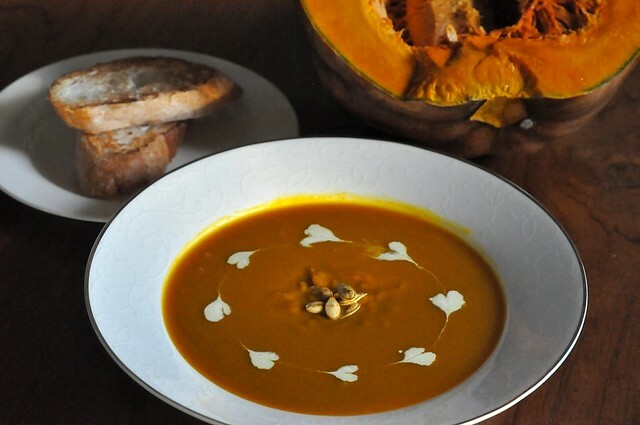 The recipe doesn't say how much pumpkin ("a large butternut squash") so I use quite a lot so that the soup is real thick and rich without the need for lots of cream. I find the one tablespoon of ground cardamon in the original recipe too over whelming and prefer to add it in small amounts until I get the right spiking. I also reduced the butter from 3 tablespoons to a healthy 1 tablespoon only and instead of adding one cup of cream to the soup, I serve the cream separately because the soup without cream is already heavenly. A couple of slices of toasted baguettes and this soup makes a great simple snack or light lunch. 1. Peel and cut pumpkin into small pieces. In a medium-sized pot, fry onions in the butter until the onions are soft. Add the pumpkin and cardamon (sparingly and to taste), stirring well. Add the stock, cover and simmer 15 minutes or until pumpkin is soft. 2. Use an electric hand blender to puree the soup. If too thick, add some water or stock. Season lightly with the salt and pepper. You can either add 1 cup of heavy cream now or serve it separately. I would surely like the egg yolkless tiramisu recipe! the pumpkin soup looks very creamy MMMMMM..
OMG, pumpkin soup is the best! =) drrooool! did you get my email? hoping to hear from you soon so I can make flight plans. whoops, it's me, Dae using Kimi's google account. u say: "pumpkin with dashi and pumpkin soup, the only ways I cook pumpkin." no pumpkin pies, breads, squares or cookies? no whipping them up or pureeing them with leeks and shallots and serving them instead of potatoes? no shredding them and combining them with potatoes for pancakes? not even roasted with maple syrup, brown sugar or honey? do you really mena to tell us that you're not pumpkin and cinnamon ravioli and serivng them with lamb chops?